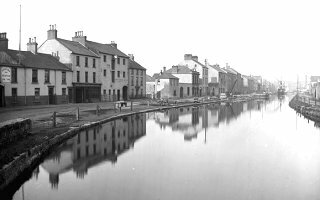 Contrary to frequently expressed sentiment, Newry Canal was not the first in these Islands, but the first summit-level canal; the first, that is, to be fed from a lake at higher level, in our case Acton Lake, some half-way along its length. The construction originally was under a German engineer who had the distinction of having built the first stone lock in Ireland. He had no heart in the job and was dismissed after three years. His replacement Thomas Steers, an Englishman was no less tardy and the work stretched out from 1737-1741. There were many initial and indeed continuing problems of construction but it finally opened for trade on 28 March 1742. On that date The Cope under the ‘command’ of William Simple bore a load of coal from Tyrone destined for Dublin. There were flags flying, the firing of guns and other celebrations to mark the great event.